Stila Countless Colour Pigments Groupie photos, swatches, make up looks! How ironic is it that out of a collection called Festival of Colour, I bought the neutral eyeshadow trio. Le sigh. But let me explain! A couple of months ago, my friend was heading to New York and asked me if I wanted anything from Sephora. I patted her on the shoulder thinking "You'll be sorry you uttered those words", but in fairness, I didn't ask her to get too many things for me. One item on my list was one of the Countless Colour Pigments from Stila which weren't out here at the time. I got a bright one, Acoustic, and wouldn't you know it, it's not available to buy here yet, so that's why I haven't blogged about it yet. But back to the one I bought here recently for €18.50 in Harvey Nichols. This is Groupie and she's beautiful. Looking like a mish mosh of colours, each pan is one of a kind, housing swirls and blobs of colours that can be combined to create lots of different looks. Groupie has a shimmery champagne shade that blends into a light golden orangey shade, that then leads into a darker brown shade and all in all, is right up my street in terms of an every day, wearable trio. Pigmentation is fantastic with these and I know, looking at the pan, it can be a bit daunting with all the colours blended together like that. I worried that I might mix them up and then forever just have a big old muddy mess, but fear not, I'll explain what to do below. Of course, I had to show it to you in action and the first look shows what you can achieve using each of the shades individually. They all have a pearl finish, blend effortlessly and are an absolute joy to use. Below, I've applied the orangey goldy shade on the eyelid and taken it under the lower lashes. I took the brown shade and applied it to the outer corner and brought it slightly up into the crease and took it below the lower lashes too. 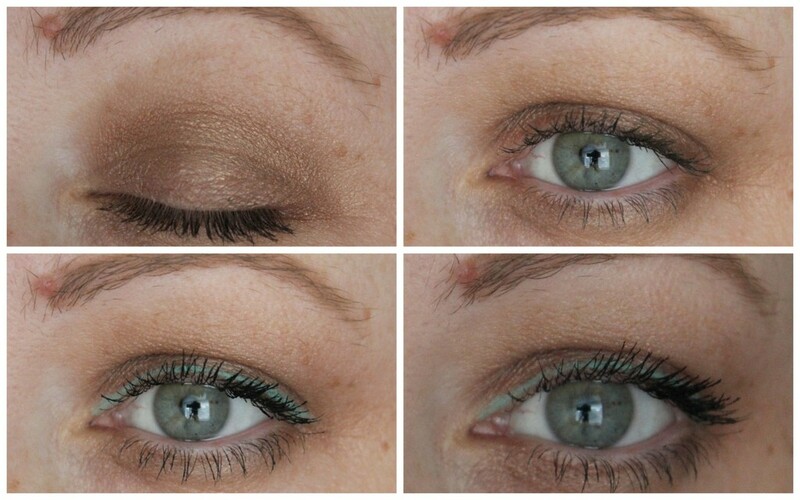 I used the champagne shade on the inner corner and took it lightly onto the brow bone. This took all of about 4 minutes to achieve and that was including taking photos. If you're into having just one shade across the lid, then use a fluffy brush and swirl it across all three colours in the pan. 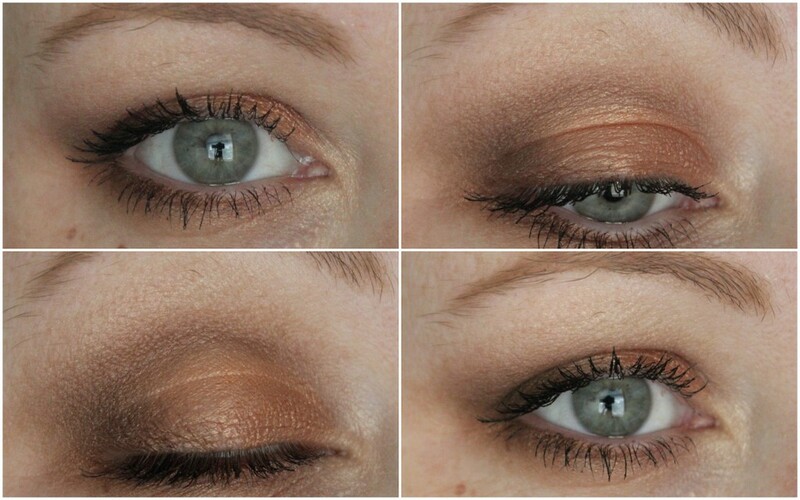 This gives a shade really similar to Mac's Patina and gives a lovely neutral eye makeup look in seconds. You know me though, I couldn't stop there. So I took my Turquoise Smudge Stick from Stila and took it lightly along the upper lash line, adding a smidgen of colour without going too wild. Simple, effective, with a touch of interest. These guys glow under UV light, so if you're going to be in the vicinity of a black light, make sure your blending is up to scratch! But I won't be remotely close to a black light and am ok with that. This trio has fast tracked itself into my make up bag where it's on heavy rotation. Let me know if you'd be interested in seeing Acoustic in action. It's gorgeous! Do yourself a favour and head to your Stila counter to check these trios out. There are some stunners in there and if you want to add some colour to your make up looks this summer, then you need to go and swatch and try to figure out which ones you love the most! Such a lovely neutral 'palette' - if you can call it that - of colours! I will definitely be trying them individually and blended!